Whether a majestic arch in the sky that appears after a short spring shower or a small, homespun rainbow created with a garden hose on a sunny day, a rainbow operates as an egalitarian visual experience. It is by nature temporary, undetermined, and wonderful. The Rainbow exists somewhere between real and representation, actual and artifice. It’s an interesting thing, this space between real and representation. Is McKean’s rainbow (or Smilde’s cloud) as joyful as a real rainbow? It takes advantage of the same physical phenomena. It is materially identical to a natural rainbow. 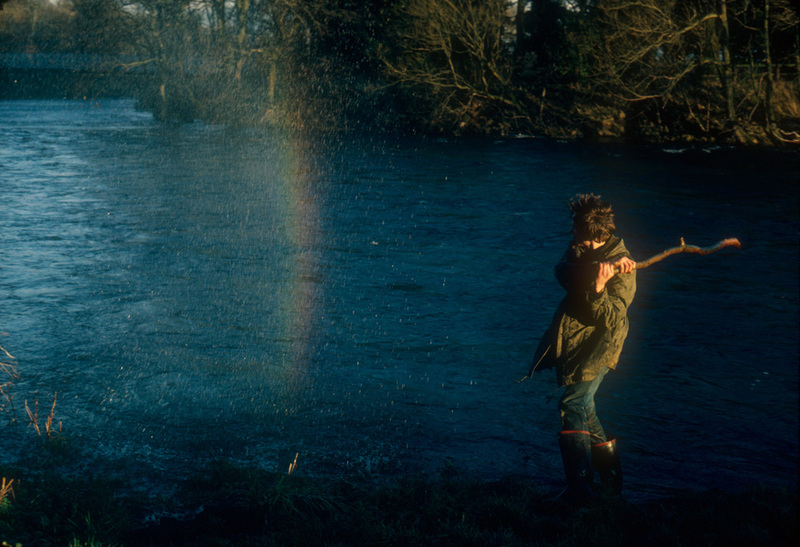 And yet, part of the joy of real rainbows is that they can’t be summoned — they are by definition elusive, serendipitous. And actually, this is part of what makes them, in McKean’s words, “an egalitarian visual experience.” No one owns the means of rainbow production. We are equally entitled to its mercurial visitations. Although the symbol of a rainbow has been co-opted, politicized, branded and commodified, an actual prismatic rainbow still has an ability to jolt us from the everyday. It feels hopeful, yearning, optimistic, ghost-like and meaningful. Whether perceived immediately as an artwork or not, the experience holds the power to connect diverse publics through an intangible, shared encounter. Perhaps it is only human to try to extend and expand the joys we observe in the wild, to conjure it in whatever ways we are able. And you know, I’m not sure I’d want to be human if we didn’t. Images: photos of McKean’s piece, certain principles of light and shapes between forms, courtesy of the artist. The last image of Goldsworthy is from the Goldsworthy archive. PS: For those worried about wasted water in McKean’s rainbow project, read below. And cheer up! The artwork will solely utilize captured rainwater and will be powered with renewable sources. Leading up to the exhibition, extensive modifications to the Bemis Center’s five-story, repurposed industrial warehouse took place — creating a completely self-contained water harvesting and large-scale storage system. Throughout the project cycle, collected and recaptured stormwater will be filtered and stored in six above-ground, 10,500 gallon water tanks.